Whether your allergies revolve around household pets, dust mites, or pollen, it can be nearly impossible to escape the constant onslaught of nose and bronchial attackers. You may feel like you are walking around in a constant haze, viewing the world from puffy eyes and constantly trying to keep up with your running nose. Well, no more! The Fellowes Allergy and Asthma Friendly AeraMax 200 is a very powerful purifier, whose specifications rank it as one of the most effective and popular. So, let’s cut to the chase and take a look at what distinguishes this purifier from the rest, what it has to offer, and how it will make your home a safe haven for your allergies. The Fellowes AeraMax 200 has a turbo fan setting and is suitable for rooms up to 200 square feet. You can also get the Aeramax 100 and the Aeramax 300, and just like the AeraMax 200 these options go hand in hand with the size of room it can service. The 100 for a 100 square-foot room and, of course, the 300 for 300 square feet. With these three options, you will breathe easy in any room of your house. 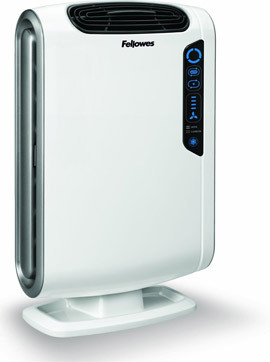 It comes equipped with a true HEPA filter with antimicrobial treatment. What this does is ensure that particles as small as 0.3 microns in size are removed from the air, and it will do away with well over 99% of them! In simpler terms, it guarantees to eliminate the worst of your enemies such as every-day germs, viruses, dust mites, ragweed and cigarette smoke. As I kept reading more about this purifier, it became apparent that the ultra-quiet operation and the four-stage purification system seemed to catch peoples’ attention a lot, and for a good reason! The list of specifications is extensive, but the carbon filter definitely deserves a mention due to the fact that it removes odors and succeeds in capturing the largest airborne particles. This is one of the points that definitely won me over at first glance. The AeraMax 200 air purifier is certified by the AAFA (Asthma and Allergy Foundation of America), meaning it’s scientifically proven to contribute towards the reduction of pollution particles. The standards imposed by the AAFA as well as the ASL (otherwise known as Allergy Standards Limited) are strict, as they give credit to only the highest quality products. After all, you want to walk into a room and actually feel the difference in air quality! Once I got started with research on air purifiers the first thing I encountered is the CADR (Clean Air Delivery Rate), and you might well wonder how this works with purifiers. Basically, the higher the number you get the faster air purifying occurs. The good news is the Association of Home Appliance Manufacturers granted AeraMax 200 the highest of numbers on three CADR ratings for smoke, pollen and dust. This mode comes in handy especially for people suffering from allergies and when it’s flu season. The unit increases the turnover of air by up to an impressive 50%, and takes (in my opinion) the prevention of air contamination to the next level. This setting does come at the expense of some noise though, so I wouldn’t use it 24/7. A manual adjustment of fan speed of which there are four to choose from, and in addition it comes with indicators for both the True HEPA and carbon filters so you know when to change them. In all honesty, what comes across as the biggest flaw is the bright blue light that might be a little bit too much in the dark. Of course, this can be fixed by covering it up, but Fellowes should have thought about this because they know that people use air cleaners in their bedrooms. I personally like my machines not just user-friendly but “intrusion” free, so quiet is usually at the top of the list for me – and this air purifier really fits the bill in that respect. In fact, it’s so quiet you won’t have any trouble using it overnight, although (again) I wouldn’t use the Area+ mode in this case. The AeraSmart Sensor controls the air quality by automatically adjusting the speed of the fan in order to keep the air as clean and fresh as possible. To make the interface a little bit easier on us all, the display panel indicates the purity of air using blue, amber, and red lights. Overall, this air purifier is a highly rated machine whose minor cons such as a bright display and silver side paneling can’t overwhelm its quality performance. Anyone suffering from asthma or indoor allergies should look into this as a way of relieving the stress of allergies on their bodies and minds. Stop living behind the haze of allergy symptoms – start breathing easy! If you’re inclined to look into it a bit more you can find the AeraMax 200 here on Amazon. For smaller rooms, you can find the AeraMax 100 here. For bigger rooms, the AeraMax 300 is here on Amazon.